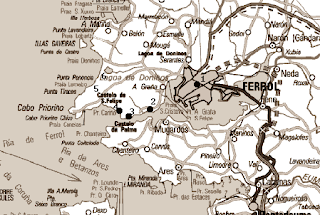 On April 2, 1966, an unidentified flying object fell into Mar de la Graña, across from the Galician locality of El Ferrol. It is the first UFO case recorded on Galician territory and forms part of the official files of the Ejército del Aire (Spanish Air Force), which are accessible through the Ministry of Defense’s Virtual Library online. UFOs had hitherto been a concern, but were not investigated. Between June 1967 and October 1968, Spain experienced a “flap” of sightings that eventually involved aircraft in flight, both military and commercial, having a powerful impact on the media. After a secret meeting attended by only seven generals of the Ejército del Aire, a message was put forth, requesting citizen cooperation in notifying sightings to the authorities. 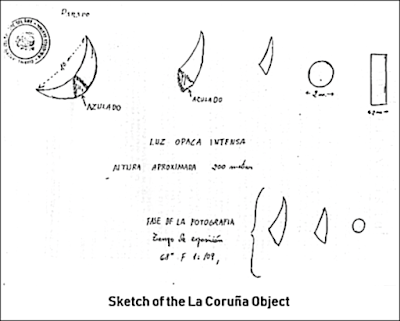 By then, the first UFO crashed in Spain was already under the waters of Mar de la Graña. It had all begun on 23:30 hours of April 2 at the La Carreira Radio Station. As the declassified report indicates, a corporal on duty, a watchman and two sailors witnessed “a sizeable object in the sky, emitting an opaque light, and changing its shape approximately every five minutes. Diario Público reported: “When fishermen arrived at the Port of Ferrol with the UFO, a group of long-faced Navy officers were there to meet them and relieve them of the object, sternly warning them to keep their mouths shut about it. The object was loaded onto an army transport and escorted to La Graña in a convoy. The UFO was hidden in one of the tunnels within the La Graña submarine base. The Navy reported the find to the U.S. base in Rota. A group of U.S. military men reported to El Ferrol to take custody of the “device” on a military truck. Nothing else was ever known about its whereabouts.